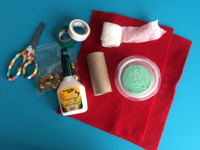 Children will love filling their elf stocking with treats. 1. Gather your material. 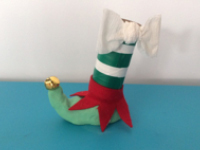 You will need red felt, a white party streamer, an empty toilet paper roll, a tiny bell, white and green electrical tape, green air-dry clay, white glue and/or hot glue, and scissors. 2. Wrap the toilet paper roll with the white electrical tape. 3. 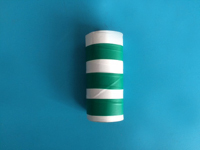 Use the green electrical tape to add stripes on what will become your elf stocking. 4. 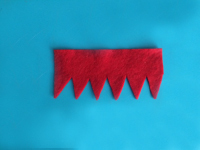 Cut a shape like the one shown in the picture out of the red felt. 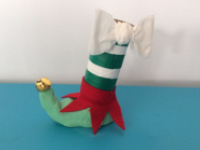 This will be the top of your elf shoe. 5. 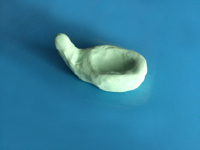 Using a large piece of air-dry clay, shape a pointy shoe as shown. 6. 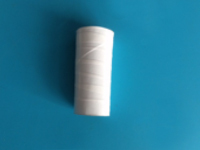 Glue the red felt around the bottom of the toilet paper roll, gently folding the triangular tips upwards. 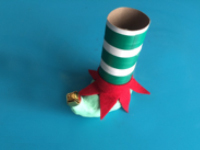 Press the bottom of your elf stocking inside the clay shoe and glue a bell on the pointy tip. Let the clay dry as per package instructions (this may take several days). 7. Use the white party streamer to create a bow and glue it at the top of the stocking. Fill the tube with candy.